Halloween is coming, so let's have fun with an easy, step by step tutorial for a fantastic Zombie makeup. No airbrush? No problem, you can still realize this look by traditional methods, although it may take you a little longer. You can see all the steps in our video tutorial as well. In this post we will give you more information on the materials we used and their possible alternatives. All the materials we will use come from our favorite makeup store: Camera Ready Cosmetics, who ship fast all over the world and have the best customer service imaginable (and no, they did NOT pay us to say this, lol). Let's Start! WARNING: Safety first. Make sure that you or your model are not allergic to any of the materials used. We will be using alcohol based colors: eyes and mouth must be kept closed when spraying these areas, and be careful not to inhale when spraying around the nose. When blow drying someone else's face always keep your other hand in between the airflow and their skin, to ensure the heat remains tolerable. Finally be very careful of both your instrument and your skin when exposing the needle tip of your airbrush for spattering and veining. Contact lenses must meet safety standards and used according to guidelines. We are using a foam latex prosthetic called Whoochie Face. These are ready made, professional quality applications distributed by Graftobian. They adapt well to any face shape and the final result is amazing! Start by removing any excess oil on the skin. Prep the application by spreading a thin coat of Graftobian Pro Adhesive all over the prosthetic. Be very careful with the thin edges: they will easily fold and stick to themselves, so try to avoid this at all costs. Use a blow drier on low heat until the glue is clear, then position the prosthetic on the face and use more Pro Adhesive to glue the edges down. Once you have done that, fill any gaps between the edges and the skin with "Bondo" (Pro Adhesive mixed with silica powder), and blow dry on low heat until all glue is clear. Set the edges with Ben Nye Neutral Set, and brush the excess powder off. ALTERNATIVE MATERIALS: Graftobian's Pro Adhesive behaves exactly like Pros Aide but is less expensive. This glue remains tacky so you can move your prosthetic a few times for optimal positioning. Spirit gum is a cheaper alternative but it is less flexible and harsher on the skin. If Bondo is not at hand you can stipple a few layers of liquid latex to fill in the edges of the prosthetic. This will take longer as you will need to dry and powder each layer. 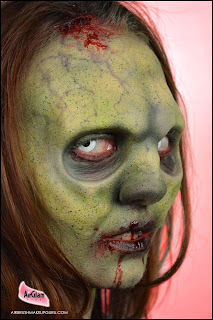 You will need to make sure the prosthetic and the face are color before starting the actual paint job. We started using alcohol based paints but found them too sheer and not very effective for this purpose. So we decided to use a product called Colair Extreme by Dinair. This is an amazing cosmetic with total blocking power, and we were able to achieve a uniform effect with just a couple of passes. Once applied, you may want to powder lightly with Neutral Set before proceeding. We actually didn't, and it worked out just fine. ALTERNATIVE MATERIALS: Pax paint (a mixture of Pros-Aide glue and acrylic paint) would have been the traditional choice for blocking out the application. However Colair Extreme is just as effective, much easier to clean from the airbrush, cheaper, gentler on the skin and comes in a wider variety of colors than Pax. Spattering is the best technique you can use to create a multi layered, more realistic effect, because it mimics the natural texture of the skin. It is also ideal for blending the edge of the prosthetic into invisibility. Spattering basically means achieving a color tonality by layering a multitude of translucent speckles of color, much like the printing process where what looks like one color to the naked eye is actually obtained by tiny dots of different shades laying next to each other. While some airbrushes have specific tips to do this, but you can easily obtain a spatter effect with any airbrush simply by removing the needle cap and the nozzle cap (the two parts that unscrew at the tip), and setting your compressor on very low pressure, then use a flickering action on the trigger. We have used European Body Art's Endura colors. These are alcohol based paints used by some of the best professionals, and most famously on the set of Face Off. They are already sheer, but you may want to dilute them more with Alcohol 99% in order to get a finer, more natural effect. We didn't and we should have, but we wanted our work to "read" more quickly for the purpose of the video. If the spatter is too saturated and individual dots too visible, you can dim the effect by blotting the application, but be fast as alcohol based colors dry very quickly. Spattering can be a lengthy process, but the result is worth it. We wanted a classic "green" zombie, so we layered yellow first, then blue, then green to add more punch. ALTERNATIVE MATERIALS: You can used an old toothbrush or a cheap brush with short bristles to achieve a spatter with your fingers without an airbrush. We find that airbrushing offers more control and less contact between paints and skin, which we always welcome. We used a less diluted amount of Endura color to create lowlights and shading. The process of is very easy as the prosthetic's sculpted shapes will make it very obvious. For a final highlight, and to simulated the thinness of the skin stretched on the features, we used Endura Face Off flesh tone in Warm Two. Airbrushing is a wonderful, fast and easy medium for creating realistic veins. Remove the needle cap (the outermost removable part of the tip of the airbrush) and use distance and pressure to create veins of different size and intensity. Practice on paper first. Achieving a purple-ish vein color was easy: simply mix Endura Red and Blue colors. ALTERNATIVE MATERIALS: Fine brushes. ...Yawn. You can create very realistic redness around the eyes with a product called Glazing Gel by PPI/Skin Illustrator. This is water based, so it will not irritate the very delicate eye area. For further punch use a red lip liner pencil on the rim of the eye. 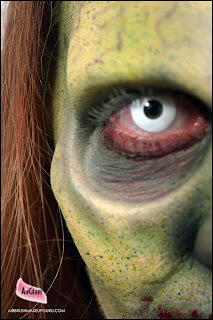 Finally, nothing is more effective to complete the makeup than a pair of Zombie lenses. We used some great disposable ones by a British company called MesmerEyez. Whatever brand you choose, make sure they meet safety standard and beware of cheap ones that can cause severe damage to your eyes. 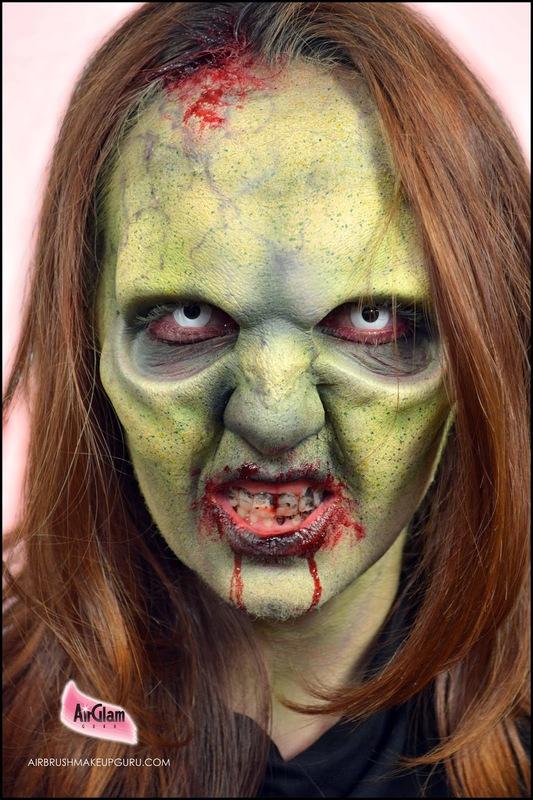 To achieve a more believable Zombie mouth we used black from PPI's On Set FX Palette. Be sure to dry the teeth before applying the color, and right after application use your airbrush on air only to set it. No Zombie look would be complete with a little bit of fake blood. We used two types: Ben Nye Thick Blood for a head wound effect, and a capsule from Ben Nye mouth Kit to create the gory mouth effect that you see at the end of the video. 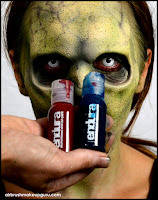 Ben Nye's fake blood is an industry standard, it is safe and even tastes good! Have a fantastic, fun filled and safe Halloween!!! Omg! this mae up zombie is really Amazing! the shadow under the eyes are very really!! Omg I love this kind of thing! I want so bad to learn how to do this things! Thanks for the tutorial! super terrificante!grande tecnica ,quanto mi piacerebbe imparare! What is the name of airbrush used? Copyright by AirGlamGuru. Picture Window theme. Powered by Blogger.